My hotel room last night had a "foyer" that was not shared with another room. I had to use my key to get into the main door, then again for my room door. But I did not remember this fact when I got out of the shower last night and went into the foyer area to be nosey and spy on people in the hall. I got locked out of my room and then walked to the front desk sopping wet and wrapped only in a towel, to request a key. 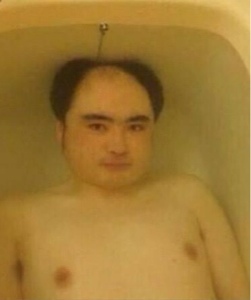 Who it the guy in the tub? Or is that a tub? Have to admit you lead a very interesting life and sometimes I wish I was there for the fun!! Glad you do updates - I'm sure there's a lot we're missing! !